They will turn out looking like the poop emoji if you are not very very careful. It’s a brown meringue- not too much you can do about that. But you can choose to pipe it out or use a spoon to shape it into a cookie. Please do the later. Poop jokes aside, this cookie has a lot going for it. It’s made from just egg whites, sugar-free sweetener and cocoa powder. Each cookie has only 9 calories and less than 1g of carbohydrate. So you are eating air, basically. These low carb chocolate meringue cookies are nice and crispy and full of chocolatey flavor. 1. Preheat the oven to 225 degrees F and cover a cookie sheet with parchment paper. 2. Place egg whites in a clean dry bowl and beat with an electric mixer on medium-high speed until foamy. Add cream of tartar, increase speed to high and whip until mixture forms soft peaks. Gradually add granulated sweetener and continue beating until whites are stiff and glossy. 3. In a separate bowl, sift powdered sweetener with the cocoa to blend. Working in thirds, sprinkle cocoa mixture over egg whites and gently fold in until thoroughly incorporated. There should be no dry cocoa powder in the final mixture. 4. Drop 12 cookie sized dollops onto the cookie sheet with a spoon or ladle. 5. Bake for 1 hour, until meringues are firm and dry. Turn oven off and let meringues sit in oven for 15 more minutes. 6. Let meringues cool on sheets on wire racks, then gently peel the cookies off parchment paper. If you liked this low carb meringue cookie, then you might like my recipes for almond meringue cookies, jello meringue cookies, or lemon meringue cookies. Oh no! Meringues are notoriously fickle I’m afraid. Even if you do everything right, they can sometimes fail. One thing to keep in mind is that the egg whites can’t be contaminated with anything at all or they won’t keep their shape. It’s very easy to get some yolk in the whites and ruin them. I have made these 2 times and screwed them up both times. When I fold in the sifted blend, it turns to brownie batter. Ugh Im frustrated. Well drat. I’m sorry you had to waste those ingredients. I’m not sure why you weren’t able to replicate the recipe, but I’m afraid that meringues are famously tricky to make. Just make sure that the eggs are room temperature and most important of all is to keep the bowl, and egg whites completely free of any other substance. It’s really easy to get some egg yolk stuck in the egg whites. That’s why I always crack each egg separately into a small bowl and if it’s clear of egg yolk, then I transfer it to a larger bowl. But anyway, I’m not sure what is happening but you should definitely not attempt chocolate meringues again. But I have a couple meringue cookie recipes on my site that don’t involve folding in cocoa powder. You could make almond or lemon flavored meringues for instance. Hopefully you’ll find a recipe that works for you. How long do they keep? What’s the best way to store them? Let them cool completely to room temperature and then store them in an airtight container on the counter. They should be good for up to 2 weeks. Did not work at all for us. They are flat and about four of them are a dark chocolate brown and the rest look like chocolate when you find it after sitting on a shelf for two years with all the oil sucked out of it. They also stick to the parchment and the only way to eat them is to scrape them off with a fork or spoon. They crumble into a million pieces. I followed the recipe to the letter. Oh no! I’ve made these quite a few times and never had that happen. Meringues are notoriously fickle though. I’m sorry that yours didn’t turn out. 225 degrees Fahrenheit is equal to 110 degrees Celsius so yes, you should use the lowest setting on your oven. If 125 degrees C is the lowest that your oven goes, then that should be fine. The cooking time isn’t right 225dg is hottest a oven can be just burnt all mine in 10mins till I realized they can’t be cooked this high??? It’s 225 degrees Fahrenheit, so it’s actually a very low temperature. I just adjusted the recipe to make it clear what system I am using. I am so sorry that your cookies were ruined! Please check back in and let me know how it goes. How much powdered swerve? The recipe calls for 1/4…I’m guessing cup? Good grief. I am so sorry. Yes, I meant a 1/4 of a cup. Fixing it now. Thanks so much for letting me know! 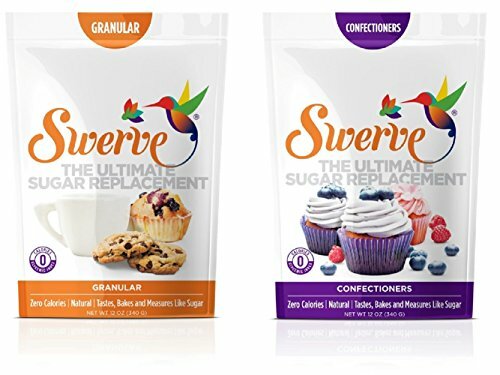 Can these be made with honey or maple syrup instead of artificial sweetener? No, I’m afraid not. They would be too heavy for the egg whites and the cookies would fall flat. Meringues are one of the few recipes where you can’t sub in a honey or maple syrup.